We talk a lot about dyno testing and seeing improvements with CorkSport goodies but we rarely talk about what dynos are and why dyno testing should be a part of your build. While e-tuning using logs and v-dyno works great, tuning on a chassis dyno can be quicker and is a just a bit safer; since let’s be honest, 4th gear WOT pulls in your local area of “Mexico” can get a little sketchy sometimes. Keep reading on for some advantages of knowing your dyno numbers. To start off, I wanted to share a little bit of knowledge of what a dynamometer (dyno for short) is and how they work. Dyno is a broad term for a machine that measures force, torque, or power. 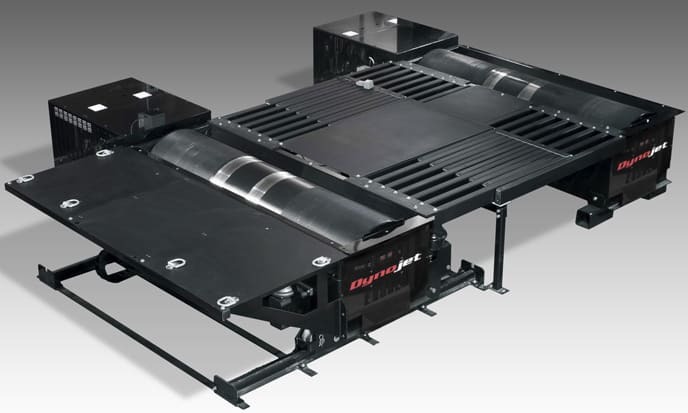 In the automotive world, we typically think of a chassis dyno that measures torque through the drivetrain of a vehicle, however, for high-level suspension tuning, shock dynos also exist. Now some of you may be surprised to hear that dynos measure torque, not horsepower. Torque is much easier to measure and can be easily converted to horsepower (HP equals torque times RPM divided by 5252 for those curious). There are a couple names of dyno you have likely seen get thrown around: Dynojet, Mustang, Dynapack, and DynoTech to name some of the most common. Each measure power a little differently but for the sake of keeping things concise, each uses a known or controlled “resistance” to fight the vehicle’s torque that is being produced. Dynojet and some Mustang dynos use a physically heavy drum while Dynapack, DynoTech, and other Mustang dynos use electricity or hydraulics to control the dyno’s “resistance”. 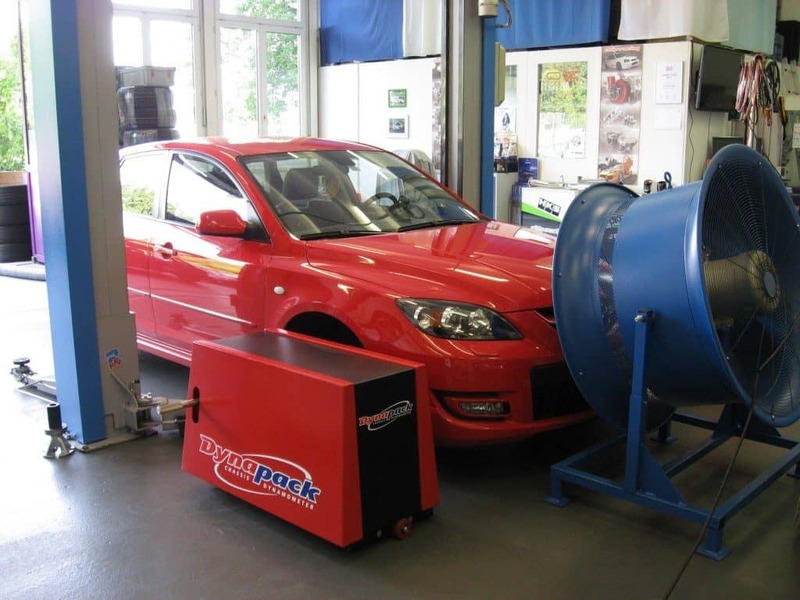 Each type of dyno has its own set of advantages & disadvantages but the most important thing to remember is that they will read differently for the same vehicle. This means if you are getting your car tested or tuned on a dyno multiple times, be sure to use the same type, and better yet same exact dyno, to really see how your build has affected your horsepower & torque. On to advantages of getting your car dyno tested. While most are not “make it or break it” changes, dyno testing can really take your build to the next level. 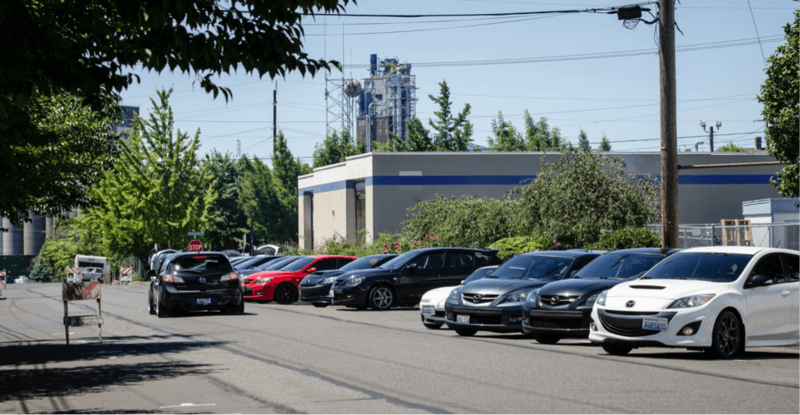 Bragging Rights: While an obvious one, dyno results make it much easier to compare your car to another since you have hard data to back you up. This is especially true if you are using the same type of dyno. On a lighter note, comparing your car to someone with a well-documented build can help you decide what your next mod will be. Ease of Tuning: Consistent and accurate pulls can be had back to back on a dyno, without having to drive out to your “dyno road” after every small tuning change. In a properly setup environment, pulls will show only tuning changes instead of having to worry about every little variable that comes with on-road pulls. 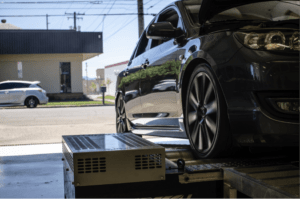 If your tuner is in town, having them live tune with your car right in front of them can turn a multi-week e-tuning process into a long afternoon. Plus, you won’t have to worry about an expensive ticket from the local boys in blue. Monitoring Car Health: Friend has the same car, same mods yet are making much more horsepower? Dyno testing can show things like this that may indicate a big problem with your ride. Removing the “driver mod” from racing your friend light to light can help determine if there’s something more going on. In addition, having hard data on power & torque numbers can tell you when to stop pushing for one more psi, keeping your ride on the road and not in pieces. New Mod Validation: Bought a part and want to see what it’s doing for you? A dyno before and after is a great way to validate your new mods and see what your next step should be. In addition, you may find out there are more benefits to a part than just max power gains. Maybe that newest part only gave you +2WHP at peak but shows gains of 10-15 through the middle of the rev range, or you can hold power to a higher RPM. Analyzing dyno graphs for more than just peak numbers is a powerful tool that can indicate how a part changes how a car feels. Obviously, not everyone has access to a dyno and it is usually expensive to use a dyno for more than a few pulls, however, it is worth it and can give you some much-needed info about your ride while keeping you & your ride safe and out of legal trouble. Looking for a dyno for your car? We are hosting the 2018 CorkSport Dyno Day in August. Dyno runs, food, a car show, and even drag racing are all on the agenda. Check out the Facebook event page for full details & don’t be shy if you don’t have a Mazda-we had a Fiat 500 Abarth on the rollers last year! Is it worth it to run on a Dyno? How does knowing your Dyno numbers help you monitor your performance? Is it better to know torque or hp? Previous PostPrevious Why Lowering Springs?